A brilliant gift for older kids, teenagers and those who can’t find time to blow-dry their hair properly, the Babyliss Big Hair is a fabulous idea. 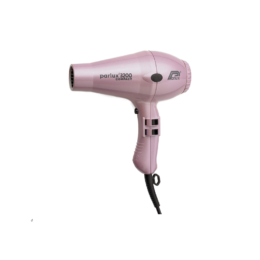 With a review from our own reviewer (thanks Nicki) and tons of great reviews on the John Lewis website, the Babyliss Big Hair styling brush is a hair dryer and blow-dry brush in one. In other words, if you’re not used to managing to hold a hairdryer in one hand and a brush in the other, or you’re in a rush or you’re simply a bit of a clumsy klutz (like me) this honestly is a fantastic solution. 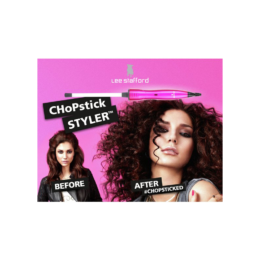 I’m hoping my teenagers will love this and it will be the answer to their lacklustre straight hair – please don’t tell them I said that! It should give them some great volume and with any luck, a whole ton of Christmas confidence now and into 2019. Will I get away with only buying one to share between them? Or is that a recipe for a seasonal show-down? I’ll report back in January. 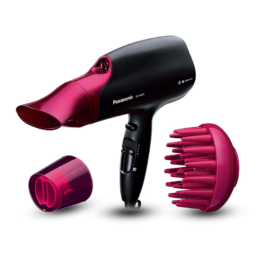 The new Dyson Airwrap is the hair-styling gift of the season. 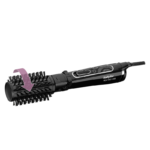 The all singing and dancing hair tool, is more of an all twirling, curling, swirling, smoothing, blow-drying magic wand. If you weren’t convinced to buy a Dyson Supersonic, the Airwrap could well be the naughty Christmas present you can’t resist. Actually not naughty at all, as the time you’ll save with the various stylers and hair dryer in one, you can spend doing all sorts of marvellous and wonderful things. To be honest, I was not personally persuaded to part with £400 on the Supersonic although thank you to our reviewers who did. We are however very, very tempted to splash out on this. My thin hair dries too quickly to really need the Supersonic, but the Airwrap is a different product altogether, giving it bounce, volume and smoothing the frizz with just one hand, and with the option of a little teasing curl here and there on a night out. Tempted? Get the kids the Babyliss, and yourself the Airwrap if you can afford it – we think this is a one-off purchase that is worth it. So, this is the other gift I’m buying my lot this Christmas. If they’re fighting over the Babyliss Big Hair Styler, hopefully one will dry her hair and then be very happy to create some curls or give it a wave with Toni and Guy’s wand. One of my daughters is in the habit of plaiting her hair at night for easy waves the following morning but it’s not the ideal look as it means the roots are flat, the hair’s pulled down and the ends often stick out at right-angles from the waves. The curl squad wand is designed to stop exactly that – lifting from the roots for body and volume, and then hand curled around the ends, the whole effect should be effortless and natural. I think they’ll like the heat-resistant glove too. I’m going to be stealing this one for my Christmas parties (do you think she’ll notice if I use it before I wrap it up for her?) Shhhh…. A fabulous gift for us all! 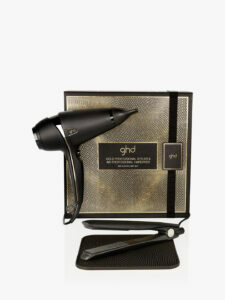 This ghd gift offers one of the bestselling straighteners of all time and the quick dry ghd Air hair dryer (See our review here). The gold hints add a festive feel, as does the ‘bling’ packaging. This set is Available at John Lewis for £199 and is great value as you will save £39 buying this set rather than buying the straighteners and hair dryer individually (from John Lewis). We love this new Tangle Teezer available at M&S. The ‘Love’ design is a result of a competition run by The Prince’s Trust Charity to promote ‘tomorrow’s talent’. A great option for teenagers and kids and £1 from every purchase goes to the charity. Only £12.50 with an extra 20% off if you have a sparks card (at time of writing 10/12/18). My daughter and I love a hair turban – they are good to absorb water and keep wet hair off your face when applying make up or getting dressed . 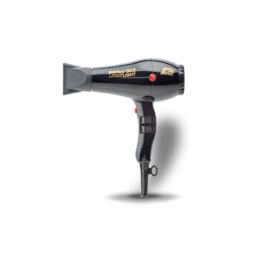 Many say the best way to dry your hair, without doing harm, is to use a combination of air drying and a hair dryer. A hair turban can help this process along by taking the water out of your hair more quickly, ready for a blow dry. At only £6, this one is a bargain and a great little stocking filler. Available at Marks and Spencer’s £8. These are fab for a quick ‘up do’. Much more attractive than a regular hair elastic and perfect for a casual event. If you prefer pastels, there are 3 other packs to chose from.